Our goal for 2019 is to set the first official record over 500 MPH for a wheel driven car with pneumatic tires and an internal combustion engine. We hope to do this with the Vesco TURBINATOR II at the SCTA sponsored Speed Week held at the Bonneville Salt Flats in August. An official record will require that the average speed over two separate one mile passes exceed 500 MPH. Our engineers are hard at work to improve the horsepower of our Honeywell T55 L-712A shaft gas turbine engine. They are also attempting to further develop our ability to control excessive wheel spin. Based upon our currect situation, we think that speeds well over 500 MPH might be possible. 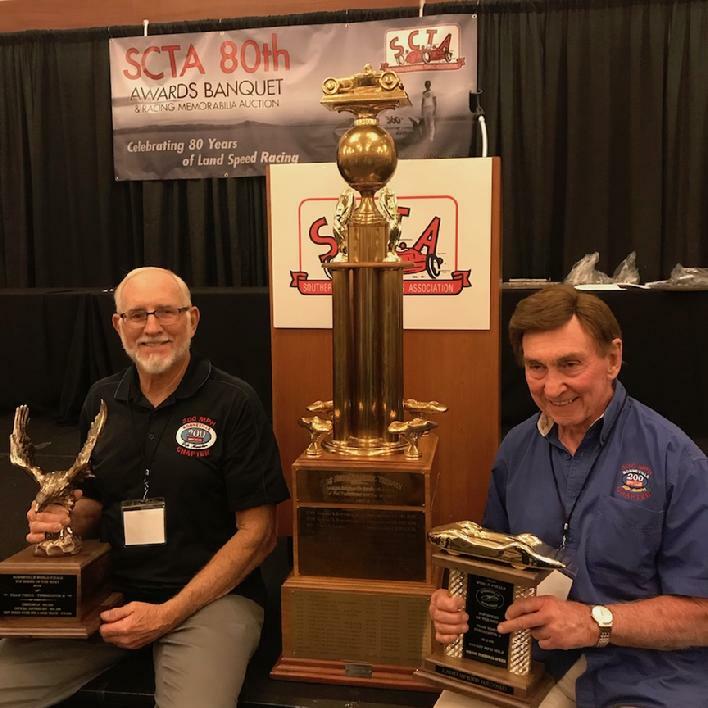 Rick Vesco and Driver Dave Spangler received honors at the 80th Annual SCTA Awards Banquet in Pomona, California. 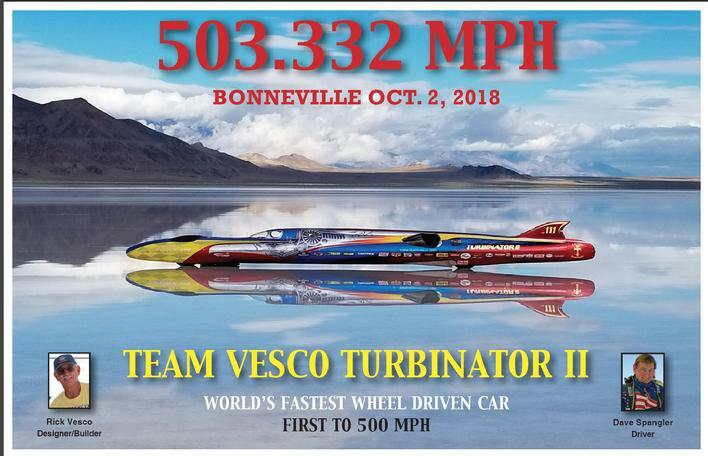 SCTA-BNI sanctioned events, 2018 Speed Week and World Finals, were the venues for Team Vesco's TURBINATOR II to set the Fastest National Bonneville Car Record in history 482.646 mph, Fastest Wheel Driven Flying Mile 493.037 mph and Fastest Top Speed 503.332 mph. Tread width fr. 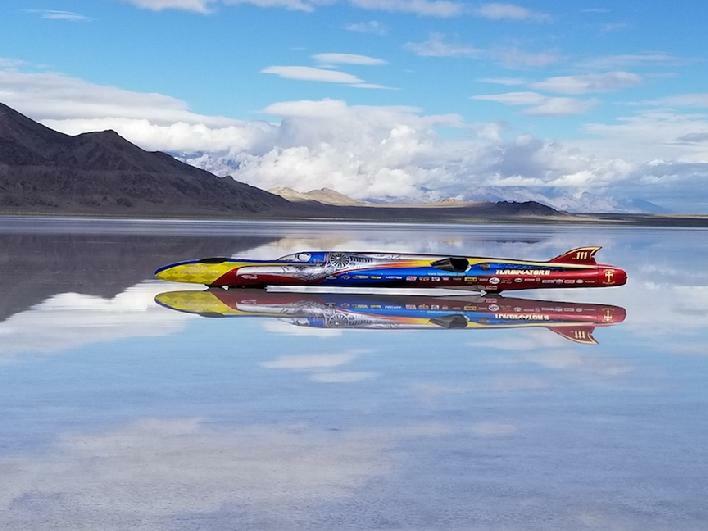 17" r. 12"
KSL Salt Lake City sports news reporter Alex Cabrero visited with Team Vesco on the salt flats to find out about Dave Spangler and TURBINATOR'S historic 503 mph run.